Use patriotic favors to liven up your next party! Don't stress over how to make patriotic party favors when the solution is simple. There are so many types of patriotic party favors that can be used for your next celebration that the possibilites are endless. Remember, party favors do not need to be elaborate. They can be kept simple. A great idea is to use the party favors as decorations. 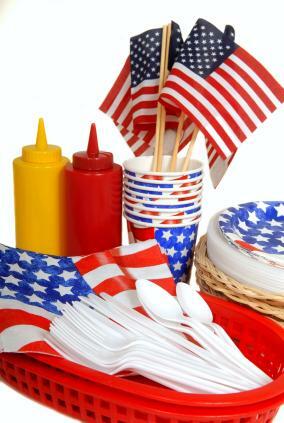 Scatter some around a table to give the table setting a patriotic look. Favors add an element of fun to any celebration. Making your own will not only save money but show off your creative side as well. Cupcakes decorated in red, white and blue. Add a festive American flag to the center of each for an extra special touch. Sugar cookies in the shape of stars adorned with red, white and blue sparkles. If you are planning on sending your guests home with an edible treat, then wrap each one in clear cellophane and tie with a patriotic bow. You could also use red, white and blue netting tied closed with a ribbon. Place each edible favor on a table and they can double as a place setting. Purchase inexpensive red, white and blue beads to string and make your own necklaces or bracelets. Give guests one to wear as they enter the party. Ribbon featuring stars or stripes can be tied into bows and glued onto pins to wear as a decoration. Be creative. There are endless possibilities out there waiting for you to try. A great place to start is your local craft store where you may be inspired with what is available on the shelves. Learning how to make patriotic party favors does not require much craft experience. Do something simple that you feel comfortable with for the best results. If you decide to purchase your favors instead of making your own, there are many places to shop. Most party stores and discount stores offer a wide range of party favors. Shop close to the specific holiday to get the most recent favors and perhaps even find them on sale. Party City has favors for various special occasions to choose from. Examples include top hats, tiaras, frisbees, leis and even fans. Oriental Trading has a patriotic section on their site filled with a variety of novelty items. The selection includes flag bandanas, leis, necklaces, beads, glow-in-the dark items and even noisemakers. The Mega Patriotic Assortment has a little bit of something for everyone. It contains 25 top hats, 25 glittered tiaras, 50 9" horns and 25 soft leis in patriotic colors. Of course, you can choose to copy something you find in a store and make your own version. Many favors could be easily duplicated at home. For example, to duplicate the votive candle holder, all you need is a clear votive cup and a candle in either red or blue. They also work well for any summer celebration or for any event where fireworks are planned. You can never go wrong with red, white and blue! The next time you want to show your American pride, incorporate some patriotic party favors into your celebration. They will not only show your guests that you appreciate them sharing your day but will add an element of fun to any event you choose to use them at.